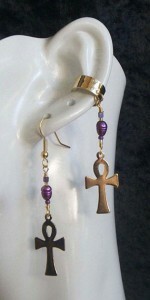 A while ago we showcased our first Egyptian Ankh earcuff and earring sets on an appropriate day of the week – Wednesday. A variation on that design using fresh water pearls came to us when we saw these stunning royal purple pearls. How could we resist recreating these popular beauties with such beautiful, new gifts from the ocean. We couldn’t! To remind our readers, the Ankh has powerful associations including the Symbol of Life, Immortality, Spiritual Reflection, The Three Upper Chakras, The Masculine God, Divination, Regeneration, and as a Symbol of Magick. However you incorporate it into your worship – and you don’t even have to be an Egyptian Pagan to use it, it will be sure to bring you the power built up over it’s 2,500 years as one of the most well-known totems on Earth.